Built to last. Great for leaves and other large debris. How good is the Pentair Great White Pool Cleaner, also known as the Kreepy Krauly GW9500? By the end of this article you’ll have a much better idea if this is the right automatic pool cleaner for you. For 2016, if you purchase a Great White pool cleaner you can get a $50 rebate through Pentair. We’ll tell you how. Nobody wants to swim in a dirty pool, but did you know having a dirty pool can destroy pool lining, your pump, and other important components of your pool? Cleaning your pool is part of proper pool maintenance providing a more pleasurable swimming experience and extending the life of your pool. There are several types of pool cleaners that are commonly used and quite effective. Prior to considering a pool cleaner, you need to know about water balance. Water balance can be confusing but is the most important aspect of pool maintenance. Water balance refers to the amount of alkaline in water or total alkalinity (TA). The level of TA in your pool water will impact the ‘potential of hydrogen’ or pH balance. Having a high TA will result in a high pH balance and having low TA will result in a low pH value. Maintaining proper pH levels is essential to preserving your pool components. Why are TA and pH levels important? If the pH value is high, bacteria and germs will not be killed. If the pH value is low, you can experience irritation of the eyes and skin while swimming. Low pH can also be corrosive destroying your pool lining and pool components. In order to maintain proper alkalinity and pH levels, it’s important to frequently check levels with a pH test kit. The standard alkaline levels for most pools is 100 ppm. The pH level should be between 7.4 and 7.6. Levels between 0 and 7 represent low pH while readings between 8 and 14 represent high pH levels. Low pH will dissolve chlorine too fast and high pH will make the chlorine inactive. Chlorine is the chemical that kills potentially harmful bacteria and germs. Additional aspects of water balance include the calcium hardness of the water and the use of a stabilizer. Ideal calcium hardness for a pool is 300 ppm with the average between 200 and 400 ppm. A simple calcium hardness test will determine if you need to add more calcium or water to get the appropriate level of hardness. Having too much calcium will make your pool water cloudy. The additional calcium can also stain the pool lining. Having too little calcium can cause the plaster to begin to erode. A stabilizer will prevent your chlorine from breaking down too fast in the sunlight. It acts as an insulator extending the life of the chlorine. Monitor your pools TA and pH balance often. Maintaining proper water balance will extend the life of your pool and keep your water clean and comfortable. Once you’ve established proper water balance, it’s important to clean your pool of dirt and debris. For this you will want to use an automatic pool cleaner. There are three types of automatic pool cleaners including suction-side cleaners, pressure-side, and robotic cleaners. Pentair is a company that has been around for more than 150 years. They are the industry leaders in innovation of eco-friendly and quality water related products. One of the highest rated automatic pool cleaners is the Pentair Kreepy Krauly Great White in ground pool cleaner. Simple design means there’s less to break, increasing reliability. Bristle drive removes dirt, algae, and debris for quick and thorough cleaning. Programmed steering easily navigates around pool obstacles for optimal cleaning. Free Vac-Port door fitting for installation into dedicated vacuum line. Adjustable regulator valve and free flow gauge allows you to set the appropriate cleaning speed. No assembly required, hook it up and let it do the cleaning for you. View or download the MANUAL for the Great White Pool Cleaner. ✓Currently, Pentair has a $50 rebate available for the entire duration of 2016. Purchase a Kreepy Krauly Great White between January 1, 2016 and December 31, 2016 and receive a $50 Consumer Rebate from Pentair in the form of a prepaid Visa card. Read the official (coupon) form to find out more details. You will need your reward coupon code and product serial number. You must mail in supporting documentation after completing the online form. View or download the coupon form for the Great White pool cleaner. The Great White pool cleaner contains a bristle drive that cleans deep dislodging tough dirt and tiny pebbles. 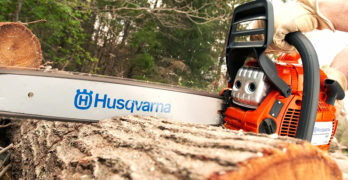 The vacuum line hooks up to a dedicated vacuum port for greater efficiency in vacuuming away small and large debris. Programmed steering allows the Great White pool cleaner to easily maneuver obstacles avoiding potential hang-up. It also features an adjustable regulator and free flow valve allowing you more control over speed ensuring optimal cleaning performance. The Great White pool cleaner comes with a vac-door fitting for easy hookup to an existing dedicated vacuum line. There is no assembly required. Simply hook the Great White pool cleaner to the vacuum line and its ready to start cleaning. With a 15 inch cleaning path, the Great White pool cleaner quickly scrubs, cleans, and vacuums the floor and walls of the pool. It is designed for any size or shape in ground pool cleaning gunite (also known as gunite), fiberglass, and tile, cement, and vinyl pools. The Great White pool cleaner comes with 32 feet of hose and a 2 year manufacturer’s warranty. Its lightweight makes it easy to lift in and out of the pool. Read the manual for detailed instructions. How deep of a pool will this work in? The Great White pool cleaner is designed to work in pools up to 6 feet deep. Though, many customers report using this pool cleaner in a 10 foot pool with no issues. Additional hose may be required depending on the size of the pool. Is the Great White noisy? Minimal noise is actually produced from the Great White pool cleaner. Most notable noise will be detected from the pool pump depending on the type of pump you are using. Make sure your pool cleaner hose is long enough. Yes the Great White is designed with programmed navigation allowing it to easily maneuver pool stairs and other potential obstacles. Does it remove algae from the bottom and sides of the pool? The Great White will clean and remove algae however, it’s recommended you use an algaecide monthly to maintain proper water balance. Does it pick up leaves and if so where do they go? The Great White cleaner easily picks up leaves and debris. Any debris vacuumed up will go to the pump strainer basket. Which would you recommend the Great White or a suction-side cleaner? The Great White is economically the better choice versus a suction-side cleaner. It is able to easily climb the sides of a pool as well as climb and clean stairs. It requires minimal interaction and cleans the pool in less time. The Great White pool cleaner is a top choice and is less expensive than many suction-side cleaners. Suction-side cleaners are quite popular as they are inexpensive yet do an effective job. Suction-side cleaners operate off your existing pool pump and filtration system. Suction-side cleaners are easy to operate as they generally consist of one moving part. They move around the pool using the pool pump to act as a vacuum. The dirt and debris is then sucked into the pools filtrations system. Ideal for small & medium-sized debris. Cleans floor, walls and steps. Since suction-side cleaners rely on the pool pump and existing pool filtration system it will only operate while the pump is running. The benefit of a suction-side cleaner is they are very affordable. They are energy efficient as they run off the existing pool pump and they don’t require the use of potentially harmful chemicals. They are extremely easy to install and operate. The down side of using a suction-side pool cleaner is they cause additional wear on the pool pump and filtration system. If you choose a suction-side cleaner you will need to monitor and clean out your pools filtration system following the pools manufacturer guidelines. 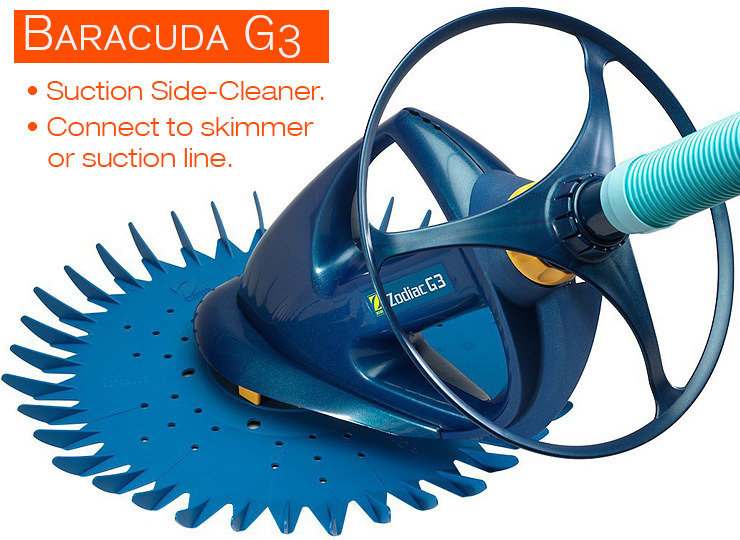 One of the more popular and highly recommended suction-side pool cleaners is the Zodiac MX8. The Zodiac MX8 works with a variety of pool pumps including solar, 2 speed, and variable speed pumps. The Zodiac MX8 features dual cyclonic suction which allows it to move through the pool faster while requiring 30% less flow. This significantly cuts back on the output of the existing pool pump. Your pool will be spotless with this model. While many suction-side pool cleaners struggle with large debris, the Zodiac MX8 features a large intake specific for large debris. It also contains a wide pattern reducing the time it takes to effectively move through and clean the pool. A major downside for automatic pool cleaners has always been navigation error and potential hang-up on obstacles such as stairs. The Zodiac MX8 features dual navigation technology known as maX-Drive. The maX-Drive technology allows for maximum pool coverage regardless of shape or size. It effectively cleans the floor, walls, and waterline without annoying hang-ups. The Zodiac MX8 connects to the skimmer or pump using a 1.5” vacuum line. It is designed for use with in ground pools made of concrete, vinyl, tile, or fiberglass. The Zodiac MX8 comes with 39 feet of twist locking hose making it easy to attach and detach. It also comes with a 1 year manufacturer warranty and now includes a new MX Flow regulator. The regulator controls excess flow resulting in higher energy efficiency. Pressure-side cleaners can be considered the middle range of pool cleaners. They are slightly more expensive than suction-side cleaners but come with several additional benefits. The way pressure-side cleaner’s work is by attaching to the return line. This is where water has been circulated through the pump system and returns to the pool. The force of the returning water creates the suction needed to power and move around pressure-side cleaners. One of the benefits of a pressure-side cleaner is they have a self-contained bag that holds dirt and debris. As it maintains the dirt and debris it does not require use of your pool’s existing filtration system. It also doesn’t require hookup to the skimmer. Polaris 280. Requires an external booster pump to make it work. While a pressure side cleaner relies on the pool pump using the return line as a source of power, it does not put as much strain on the pump as with a suction-side cleaner. Additionally, a pressure-side cleaner helps circulate filtered water throughout the pool. Pressure-side cleaners are easy to setup and are highly efficient. They can clean a pool in just over 2 to 3 hours. There are however a few drawbacks to pressure-side cleaners. The main drawback to pressure-side cleaners is they can be a bit more expensive than the entry level suction-side cleaners. Also, depending on the size of the pool they may require an additional booster pump for increased flow and suction. One of the more affordable and highly rated pressure-side cleaners is the Polaris Vac Sweep 360. The Polaris Vac Sweep 360 does not require the use of an additional booster pump making it an even more economical choice. The Polaris Vac Sweep 360 is designed for in-ground pools of any shape or size. It contains an in-line backup valve which automatically frees the unit preventing unnecessary hang-up. Well engineered and popular with customers. The Polaris Vac Sweep 360 has all-wheel drive and is powered by a triple jet cleaning system. As it is self-contained it can significantly extend the life of your pool pump and filtration system by removing pebbles and other potentially damaging debris. The Polaris Vac Sweep 360 comes with a 31 foot hose, the single filter chamber bag, and of course instructions for set-up, use, and maintenance. The Polaris comes with a 1 year manufacturer warranty as well as a 10 year warranty on the frame. While all three types of cleaners are automatic, a robotic cleaner generally comes with additional features; is often self-contained, and has a built in filtration system. Robotic cleaners are considered the top of the line of automatic cleaners for their technology and efficiency. Expensive but exceptional for cleaning pools quickly & efficiently. Robotic cleaners are the best choice for getting your pool clean in the least amount of time. They scrub, clean, and vacuum without much involvement. Some models include programmable navigation as well as remote control access. Robotic pool cleaners are a bit more expensive than the other types of automatic cleaners yet remain the most popular selection among pool owners. The benefits of having a robotic cleaner is less wear on the pool pump and filtration system. Additionally, they are self-contained and include their own filtration system. They are the fastest method for cleaning a pool and require little interaction. The only downside to purchasing a robotic pool cleaner is they tend to cost more than other types of pool cleaners. However, they remain an economical choice when considering efficiency and the alternative of paying for monthly pool maintenance. Is it Necessary to get an Automatic Pool Cleaner? There are several options for keeping your pool clean including manually operated pool cleaning supplies. The issue with manually operated pool cleaning is the amount of time and effort it requires to clean the pool. Additionally, cleaning a pool manually requires the use of harsh chemicals and is not nearly as efficient as using an automatic cleaner. If you don’t have time to maintain your pool on your own, one option is to hire a pool cleaning service. This generally costs $100 per month but includes pH testing, water balance, and general cleaning. While this might seem like a viable option, it is quite costly. Purchasing a quality automatic pool cleaner such as the Pentair Kreepy Krauly Great White will pay for itself in less than 6 months. It’s also more convenient than hiring a pool cleaning service as you have access to it whenever you need. While it’s not entirely necessary to purchase an automatic pool cleaner, it truly is the most economical and efficient choice. To truly enjoy and extend the life of your pool remember to check the water balance often, perform all manufacturer recommended maintenance on all components of your pool, and invest in an automatic pool cleaner to save time and money.